2 in 1. The Elite+ is two lasers in one system- Alexandrite and Nd-Yag lasers. Each laser is better at targeting different unwanted conditions, giving you the best results possible. on 01244 630503 or book an appointment on-line below. 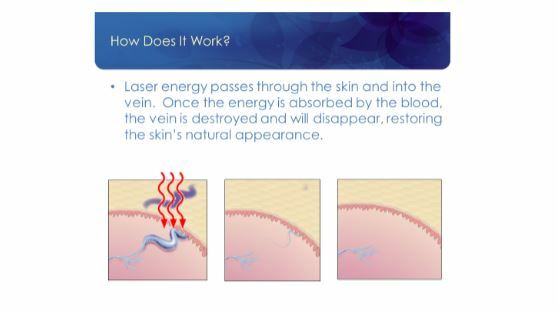 The laser handpiece will deliver light energy into your skin and will be absorbed by the blood within the vein being targeted while leaving the surrounding skin unharmed. Once the blood absorbs this energy, the vein will heat up and it will affect the vessel lining. Thus causing the vessel to constrict and eventually fade from view leaving your legs looking clear and as beautiful as ever. We use a state-of-the art laser device for our leg vein treataments – Cynosure’s Elite+. The Elite+ encompasses two proven wavelengths that provide an array of laser treatments. Treatments with this system are fast, effective and safe. With spot sizes up to 24mm, the Elite+ laser provides fast treatments, allowing you to resume your normal activities as quickly as possible. The Elite+ uses a proven 1064mm wavelength for effective treatment of leg veins in just a few sessions. The Elite+ system has been in clinical use for many years and has been proven safe in many clinical publications. Depending on the size of the are being treated, they ca take just minutes. Typically, treatments are no longer than 30 minutes. Before your Elite+ leg vein treatment, our therapist will typically apply a gel to the area being treated. This will help ensure the laser energy is delivered appropriately and will help cool the area during and after treatment. We will begin the treatment by moving the laser handpiece over your skin, following the length of the vein and pulsing the energy as we go. You will be provided with safety goggles before the treatment to protect your eyes but you may still see flashes of light as the laser energy is being delivered to your skin. You will also feel a mild sensation and heat on the skin during the treatment but air cooling may be used to help with any discomfort. The vessels may undergo immediate greying or blanching, or they may exhibit a slight purple or red colour change. The vessels will fully or partially fade in about 10-14 days. Refer to your post-treatment care instructions provided by your therapist for more details.